Plot Summary: On their first day of high school shy Ayumi Nonomura and taciturn Tatsuki Iizuka become lost on the immense campus of Kamizono Academy. An irresistible force of nature named Torako Kageyama accompanied by her best friend Suzume Saotome appears in front of them. 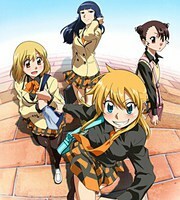 Led, sometimes pushed, by Torako, the girls and their classmates work through problems of school, home and adolescence.